Norfolk Academy grad Pierce Derkac is a co-captain at Cornell. This is a lacrosse column. No, it's not about tragedy. It's about a 22-year-old college senior who, when his hall of fame high-school coach tells you about him, the gruff, tough man has to pause to collect himself. Every day, Pierce Derkac shook his hand after practice, the coach reveals. Every single day. What kid does that, I mean, besides the two other Derkac boys who earlier starred at Norfolk Academy for Tom Duquette? "And not just a perfunctory handshake," Duquette said. "It was thanks for being out here, for coaching me, for helping me get better. Part of that's how they were brought up, but it's also about character and leadership." So this is about a natural leader, a co-captain at Cornell who helped push a reeling program stung by heartbreak and attrition to its third NCAA Final Four in four years. It is about a family's third Ivy League captain - the others were at Brown - who urged his teammates to prevail over staggering disappointment in last year's title game; Syracuse miraculously tied in the final seconds and won in overtime. Who got them to urgently jell despite 17 new players, and to believe through an uneven 12-5 season. They believed: Cornell has a national semifinal date Saturday with Notre Dame in Baltimore for the right to play Virginia or Duke for the title. "It's an unbelievable journey that this team's gone through," said Derkac, whose Big Red lost 4 of 7 games before the NCAA tournament, and then was pushed to overtime by Loyola in the first round. "We were posed with a big challenge to speed up the learning curve; there was no time to waste pretty much. We've done a lot of growing up in the last nine months. To get back to the show, it's a great opportunity and a great experience." Yes, this is about a child of privilege; the son of a heart surgeon, Derkac spoke recently to an Ithaca reporter about fox hunting on his family's 100-acre farm near Charlottesville, and its friendship with actress Sissy Spacek. A-ha, you say? Fine, but understand that this is not about selfishness or senses of entitlement. The community service portion of Derkac's nomination for a "senior class" award sponsored by a national home improvement chain fills a laptop's screen. It details a young man's organization of blood drives, literacy campaigns, mentoring services and make-a-wish foundations in and around Ithaca. 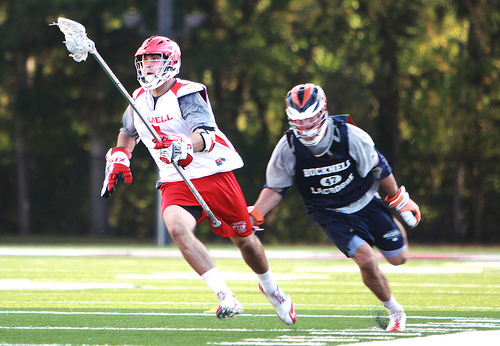 Ask a coach: selfish athletes don't leap to become a long-stick midfielder - lacrosse's version of a grunt worker - within their first few days on campus simply because their coach requests it. The selfish don't become captains at Cornell and go on to call the title "the greatest honor I've ever received." They don't then become relentless defenders and accomplished collectors of ground balls, the hardscrabble duty that turns so many lacrosse games, unless they are all in, helmet to cleat, to their program's team-first credo. "Ground balls are about want-to and putting yourself at physical peril," Duquette said. "They're about, 'Yeah, these other three guys want it, too. But I'm gonna get it.'" In the end, though, this lacrosse column is also about irony. It is about an academic All-American, days away from receiving his degree in applied economics and management, whose fervent wish is to miss his commencement ceremony. Cornell's seniors walk at noon Sunday. The national lacrosse final is Monday. The handshakes for Derkac's professors can wait.